Clears the air like an ocean breeze. Most indoor particles that are airborne tend to be positively charged. Negative ions will give some of the particles a negative charge. The positive and negative particles then combine with each other become heavy and fall to the ground. These irritants can cause various symptoms of discomfort and allergic response. Many of these are invisible and are present in small quantities. But, consider that the average person takes 20,000 breaths per day and spends 90% of his or her time indoors. 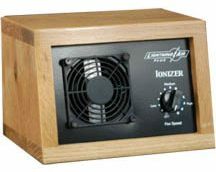 Compact and portable, the Ionizer can easily be moved to different locations. It can be used in homes, offices, apartments, motel rooms, dorm rooms and recreational areas.